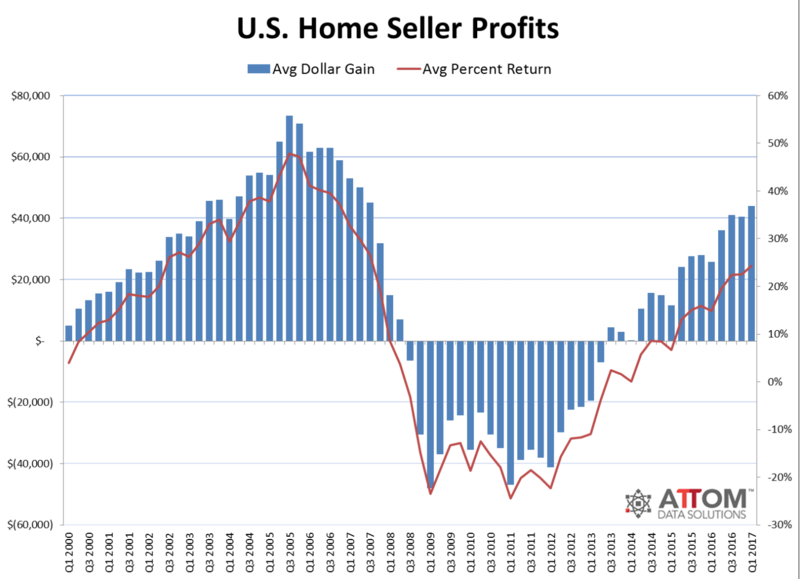 Data powerhouse Attom Data Solutions (parent company of RealtyTrac) recently released their Q1 2017 U.S. Home Sales Report which showed that homeowners who sold in their homes in the first quarter realized an average price gain of $44k, which represented an average of a 24% return on the purchase price. This is the highest average price gain for sellers since the third quarter of 2007. Metro areas with the highest percent return on the previous purchase price were San Jose, California (71% average ROI); San Francisco, California (65%); Seattle, Washington (56%); Portland, Oregon (52%); and Modesto, California (51%). In addition, the report also showed that homeowners who sold in the first quarter had owned their home an average of 7.97 years. “The first quarter of 2017 was the most profitable time to be a home seller in nearly a decade, and yet homeowners are continuing to stay put in their homes longer before selling,” said Daren Blomquist, senior vice president with ATTOM Data Solutions.